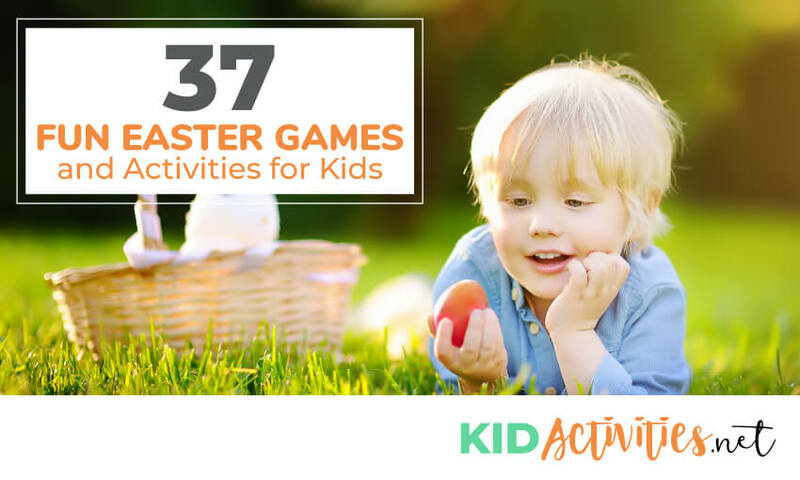 Below you will find a collection of fun Easter games and activities for kids. These are great for the classroom, at home, or daycare. 1. Find a deep, clean, non-see-through container to pour in several bags of JELLY BEANS. 3. Divide into teams and have one person at a time from each team, draw out a jelly-bean. The team is awarded the points for the color that is pulled out. 4. The drawer gets to eat the jelly-bean. The first team to reach 500 pts is the winner. (Skittles, etc.) this is also a great transition activity or to get the group to quiet down! When the number seven is reached, that player must say, “I love the Easter Bunny“, instead of seven. When the child fails to do so and says seven, the child is out of the game. The game continues until only one player is left to be declared the winner. The Egg Roll is basically a race,the eggs are rolled down the hill and the one that reaches the bottom first, wins. Played the same way as tag except that everyone must hop (if you do anything but hop then you’re automatically it. Gather a large amount of different colored plastic eggs. Separate the eggs and hide each half in a different place. The children must match up their egg half to the hidden half to play the game. When children have found their half–encourage them to help those that are still searching. All get a prize for playing. Draw and cut out two large cardboard eggs for each team. Decorate them with paint, markers, or crayons. Have each player choose a partner and give each pair of players two eggs. 1. In each pair, there is a hopper and a helper. Starting at one end of the room, the helper places an egg on the floor in front 2. of the hopper, who hops onto it with both feet. 3. The helper then places the other egg a little way ahead and the hopper jumps onto it. 4. This continues until the pair gets to the end of the room. Now players change roles. The first pair back to the starting line wins. This can be played as a relay. When one couple returns, the next two people in line continue! Also when young children play this—–just play and hop! Forget the competition! 1. Put the bunny drawing on the wall. 2. Cut egg shapes out of different colored construction paper to represent Easter eggs. 3. The eggs should be as large as the space between the rabbit’s paws. Blindfold the children in turn — and give each an egg, which is to be taped on the drawing. The child who tapes their egg closest in the Bunny’s paws is the winner. Have children use their detective skills to find the “eggs” and then, once the eggs are collected, find the hidden words. (They’ll try to create words from the letters on the alphabet eggs.) The winner is the team who can make the most words. But first … you’ll need to create the eggs. 1. Draw lots of eggs on colorful construction paper. You can make them different sizes, anywhere from 2 to 6 inches long. Cut them off the paper. 2. Decorate one side of the eggs with interesting patterns. Write a letter on the other side. (Example: three for A, three for I, etc.). Make some extra blank eggs. These will be used as “wild” eggs, which means players can decide which letter they want the egg to be. 4. When you are done creating, ask someone to hide the eggs inside your class, house, or yard. 1. To play this game all you need to do is divide the kids into teams, and have them form a line. 2. The first child at the beginning of the line takes the Easter egg and puts it in his/her spoon. 3. This child then passes the Easter egg to the next one in line, until the egg has traveled to the end of the line, and all the way back to the beginning of the line. 4. The first team to get the Easter egg back to the front of the line is the winner. When coloring boiled eggs, leave one white for this game which is very similar to Italian Bocce Ball. Place the white egg in the center of an open space and take turns to see who can roll their dyed egg closest to the white egg without touching or moving it. YOU CAN ALSO PLAY THIS WITH PLASTIC EGGS! Children will take turns “Pinning the Tail” on the bunny, using Large Cotton balls and tape. Have the kids line up at the Start Line, squat down and grasp their ankles with each hand from behind. On GO, they waddle to a designated Finish Line. They can’t let go of their ankles or they’re disqualified. The first child over the Finish Line is the winner. Play Follow the Leader with an Easter theme…Start hopping and then add other movements as well. 1. Take a jar and fill it with Easter eggs, jelly beans, etc. Count the candies as you put them in the jar. 2. Leave a piece of paper and a pencil next to the jar and have all the children guess how many candies are in the jar. 3. Be sure they write their name on the paper beside their guess. 4. The child who is the closest without going over wins the jar! IDEA: Also give each child an Easter goodie for being a good sport and guessing! A BETTER IDEA: Have the child that won-divide the candy for the entire group. Use a piece of rope to hang a basket from the branch of a tree or playground bar. Fill plastic Easter eggs with popcorn kernels for weight and tape them shut. Have the children line up behind the basket and take turns throwing eggs into the basket. Once the children can to this with ease, try swinging basket. Write the name of each child on one of the plastic easter eggs you hide. 1. Play the “EASTER BUNNY SAYS”, instead of “Simon Says.”..
3. EASTER BUNNY, EASTER BUNNY, WHERE’S YOUR EGG? Cut-out a large paper egg. Easter Bunny, Easter Bunny, where’s your egg? the new bunny in the middle. 1. Use pieces of masking tape to make Bunny foot-prints all over the floor. 2. Start playing some Easter music. 3. Have children pretend to be Bunnies and hop around the room. 4. When you stop the music, have the bunnies find footprints to stand on (one Bunny to a paw-print). 5. When you start the music again, have the bunnies continue hopping around the room. 1. You’ll need one, hard-boiled egg for each pair of children. 2. Have the children stand across from a partner. They should stand one foot apart. 3. When the leader says, “Go” the children should toss the eggs to their partners. 4. With hard-boiled eggs, everyone can play the whole game because the eggs won’t crack. 5. With each toss, the children should back up one step. Play until the eggs are destroyed and before the kids get bored. 1. Use a tablespoon and a hard-boiled egg or plastic Easter egg and plastic spoon. 2. Children try to walk fast holding the egg in the spoon to the finish line. 3. It can also be done as a relay and have one child in the middle of the race line waiting. 4. The children transfer the egg to their relay partner’s spoon and go! 1. Give each child a tablespoon and a hard-boiled egg. 2. The children form a line and one is the leader. 3. Each one holds the spoon with the egg in its bowl at arm’s length and hops on one foot, following wherever the leader leads them. 4. To drop the egg or rest on both feet prevents one from continuing in the game. They stay out until the next round. 1. On a table, the pavement outside, or inside on the floor, mark four parallel lines, eight to ten feet long. If you’re playing on a table, it may need to be shorter. Space lines four or five inches apart. There should now be three narrow spaces. 2. At the END of each space, make a circle, numbering the middle one 10, and the other two, 5. In the middle of the spaces—mark the middle one ”, and the other two, 1. 3. The object of the game is to have each child roll five eggs, one at a time, down the middle space to the circles at the ends. 4. If the egg goes into the middle circle, it counts 10, but if it stops in the middle space, it counts 3, and so on. Count the number of each place where the egg stops. 5. Tally is kept for each child; the one scoring the most points wins the game. 2. Place each team on one side of a table opposite of each other. 3. Place a colored cotton ball on the table and pretend it is a Easter egg. 4. The object of the game is to blow the egg off the opposing teams side of table. Players can not use their hands in any way. This is a version of an “IT GAME”. The “Easter Eggs” group up and decide what color Easter egg they want to be. When everyone has picked their color, they turn around and line up facing the wolf from a agreed upon line. The wolf then starts to guess colors. As the wolf guesses, the player with that color steps forward one step and spell out their color. Example: If the color is ‘brown’ they spell out B-R-O-W-N before the wolf tags them. As soon as the player spells their color, they run a pre-determined “Obstacle Course” or circle. The run must be completed before they are tagged by the wolf. (If the eggs makes it back to the “basket” with the other eggs they group again and the one that ran chooses another color. The game goes on until the wolf tags someone, and that person is then the new wolf. Variation for a small group: This game can also be played by eliminating players as they are caught. When one person is left– that person is it. This is a great game for younger children to learn how to spell their colors. Be sure to instruct younger children to choose a shorter color name (red) and one they KNOW how to spell. 29. EASTER’S COMING…DANCE! DO THE BUNNY POKEY! Yum, yum, yum, in my tum. The fifth baby bunny said, Look what I see! Have fur like any cats’.